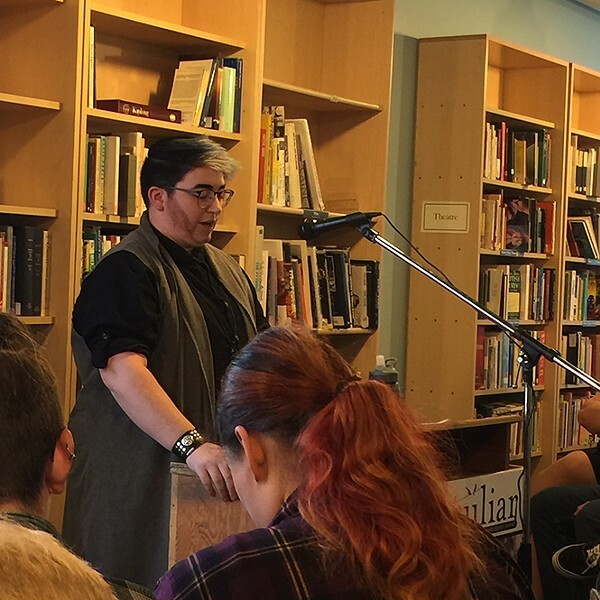 A Utah County literary journal creates a unique platform for LGBTQ writers. While the designation of "a peculiar people" has often been applied to Mormons in the sense of being strange or unusual, the faithful have also reclaimed that designation by using the scriptural definition of "peculiar" as "select" or "chosen." So maybe there's an appropriateness to naming a queer literary journal based in Utah County peculiar, in multiple senses of the word. On April 17, peculiar marked the publication of its fifth issue with a now-customary launch event and reading at Provo's Pioneer Books. This success story, however, began as a recognition by co-founders and co-editors Jack Garcia and Aaron Gates in 2015 that there was a kind of literary magazine that wasn't represented in their corner of Utah. "I was an English major with a creative writing emphasis at Utah Valley University," Garcia says. "I'd get published in student journals. [Aaron and I] were both queer, and happened to be roommates at one point. I think we were complaining about submitting somewhere and not getting in, and thought 'We should start one. What is there not around here?'" The answer was obvious: an LGBTQ-themed literary journal in the heart of Mormon-dom. The process then began simply enough, the way many creative ideas now begin—with a Facebook page and a Kickstarter campaign to cover the printing costs. "We made a Facebook page and just started to say, 'Hey, we want to start this,'" Garcia says. "To our surprise, we started getting some actual submissions." The review process is designed so Garcia and Gates don't know the identity of the authors. A third party prints every email without a name attached, allowing the editors to review them blind, to avoid any perception of favoritism or unfair exclusion. Some authors choose to publish under pseudonyms—perhaps because they are not out to friends and family—but many do not. For that first issue, there was enough material to generate a 75-page issue. "We got enough quality work," Garcia says, "that it excited us enough that we could do it again." There was still the matter of launching that first issue, and figuring out what the reception would be. And while it was certainly important to find an audience interested in paying for peculiar, it became almost as important to realize what the project meant to those who were published. "When we first started sending acceptance emails, people would be really thrilled," Garcia says. "A lot of people submitting to us, it was their first publication. Seeing the responses from people we published was enough to go, 'Hey, maybe this is a good thing.'" When the launch event took place, and they sold many copies that night, "it solidified that it would be something important," Garcia adds. While it would be reasonable to wonder if the magazine has been met with resistance locally, Garcia says that he's unaware of any opposition to peculiar. "We are a literary journal, and a lot of people don't read literary journals to begin with," Garcia says with a laugh. "It's not like we're shoving it in people's faces. Pioneer Book itself is somewhat conservative, but we've been embraced with open arms." While the process of determining the content for peculiar has remained largely the same since that first issue, the operation has evolved. A graphic designer, copy editor and social media manager also provide support for Garcia and Gates, and each issue now showcases a "featured writer," who might have contributed multiple pieces and will get a photo and short bio in addition to the published work. There's also the realization that with fewer queer writers than there might be in other markets, there is the possibility of tapping into the same pool repeatedly, and indeed several authors have had poems or other writings published in more than one issue. "We have noticed that, now that we're on our fifth issue, we'll reach the point of, 'Oh, this reminds me of something I've read before,'" Garcia says. "The more we see, it starts to affect what we're looking for." That phenomenon has led Garcia and Gates to consider the possibility of opening up submissions to writers outside of Utah, but they also want to maintain what Garcia describes as "that specific voice that comes from Utah." "It's a hard thing to think about," he says of that possible broadened scope. "A lot of people write from a place of hurt from the Mormon church, or their families, or conflicts within themselves, wishing to be that good Mormon kid. ... Other journals exist in the world, but none of them will sound like this one."